I don’t know about you, but I have way too many memory cards. My cell phone has a micro SD, my camera has an SD, not to mention all the other gadgets I have. Even though I want all the files on these mobile devices to eventually make their way into my computer, it somehow just never happens. I suppose this is why most of the newer computers have card-reading slots. Too bad I don’t have one of those. I did have access to the Belkin Universal Media Reader, and I’m now able to get all my scattered files into one convenient place. The Universal Media Reader allows the user to drag and drop files from one place to another place, whether it be to or from your computer, or simply exchanging files from one card to the other. It supports all kinds of card formats including MS/MS Duo, SD/MMC/MiniSD, M2, SmartMedia/xD, CF/Microdrive, and Micro SD. It attaches to the computer via USB, and comes with the software to make it work. Yeah, it really isn’t a “plug and play” gadget per se, and I was actually hoping we could have skipped the CD Rom step. I also don’t understand why it comes with two USB cables (one long and one short), but hey, pick the one you want to use. You should also pick your color. 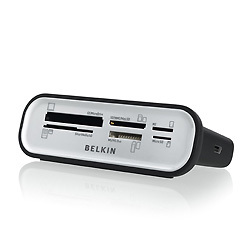 It comes in white or black, and is available for purchasing on the Belkin website for about $49.99.